In a rare occurrence, three central elements of today’s news ecosystem—the mainstream media, blogs and Twitter—agreed on the biggest story of the week, in this case, the failed Christmas Day terror attempt. 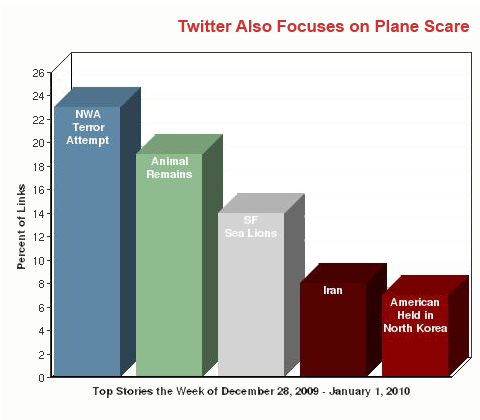 From December 28, 2009 to January 1, 2010, more than half (52%) of the news links in blogs were about the attempt to blow up Northwest Airlines Flight 253, according to the New Media Index from the Pew Research Center’s Project for Excellence in Journalism. Many bloggers assigned blame for the attack that led to the indictment of 23-year-old Umar Farouk Abdulmutallab, with most putting the onus on the Obama administration. Others expressed frustration over new safety restrictions that stemmed from the incident. And a substantial number of bloggers questioned whether citizens and the government were overreacting to the threat of terrorism. On Twitter, the story wasn’t as dominant (23% of news-related links), but it still topped the news agenda. And Twitterers brought an additional focus: a report about two bloggers visited by Transportation Security Administration agents after they posted details of new screening processes for airline passengers implemented in the aftermath of the plane attack. A number of tweets expressed concern that the government was trying to intimidate bloggers. 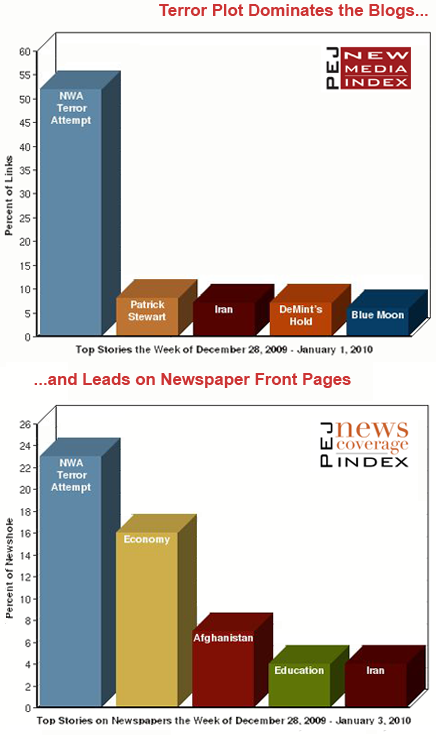 Last week’s NCI from December 28, 2009-January 3, 2010 examined mainstream news coverage in one sector, daily newspapers. And the failed airliner plot was the top story, at 23% of the front-page newshole, with a narrative that moved from examining how the security system failed to the political implications for the Obama administration to the emergence of Yemen as a dangerous front in the fight against terror. This is the first week since PEJ began monitoring the top stories on Twitter in June that the same subject has been No. 1 on newspaper front pages, blogs and Twitter. Beyond the terrorist attempt, the No. 2 story in the blogosphere (8% of the week’s links) was the knighting of British actor Patrick Stewart, best known for his long-running role in the television series “Star Trek: The Next Generation.” News about new anti-government protests in Iran that led to the deaths of at least 15 protestors finished third at 7%. The fourth story (at 7%) was related to the failed terror attack, Senator Jim DeMint’s (R-SC) efforts to delay the confirmation of President Obama’s nominee to head the Transportation Security Administration. And fifth, at 6%, was a CNN story about a rare lunar occurrence. December 31 brought a second full moon that month, a phenomenon—referred to as a “blue moon”—that had not happened on New Year’s Eve in 20 years. On Twitter, two animal stories ranked behind the airline terror plot in attention. The discovery, in a Philadelphia home, of 500 animal remains believed to have been sacrificed as part of a Santeria religious ritual received 19% of the news-related links. And the mysterious disappearance of the San Francisco sea lions who had visited Pier 39 every year since 1989 garnered 14% of the links. The next two stories on Twitter each had an international focus. The new protests and developments in Iran received 8% of the links, while a report about a Korean-American missionary named Robert Park believed to be held in North Korea was fifth with 7%. As the week began, additional information surfaced about the failed terrorist attack on Northwest Airlines Flight 523 to Detroit, including news that the suspect’s father had warned the U.S. embassy in Nigeria that his son might be involved with radical groups. Many bloggers weighed in on the political and policy implications, with some Obama critics laying the blame squarely at the feet of the President. A small number of bloggers worried about the implications for minority groups in the wake of the episode. Other commentators responded to an opinion piece on CNN.com from author Bruce Schneier who characterized the country’s fear and response to terrorism as overkill and argued that such fear could imperil some of our national values and character. Most of the bloggers who linked to Shneier’s piece agreed with his perspective. In a related discussion, some bloggers wondered about the impact of the response to the attack on future air travel. On Twitter, users focused on much of the same information as bloggers, but there was an additional story that gained traction. A December 30 Wired.com story reported that two bloggers had been interrogated by special agents from the TSA’s Office of Inspection after they posted a document explaining new screening procedures and restrictions following the failed terror plot. While the document was not classified, the bloggers received it from an anonymous source. Users of social media were worried about a precedent being set for intimidating speech online. “Apparently the TSA thinks we’re in a police state!” tweeted Seth Goldstein. “Bloggers: start thinking like a journalists, and put a lawyer’s number in your phone’s address book,” advised Sheila Scarborough. The fourth subject on blogs was closely connected to the major topic of the week. In an effort to prevent TSA workers from joining unions, Senator Jim DeMint placed a hold on Obama’s nominee to head the TSA, Erroll Southers. DeMint feared that Southers favored unionizing TSA workers which, he argued, would prevent the TSA from having the flexibility to make quick decisions. This drew significant criticism from liberals who connected it to the NWA terror plot. “In yet another shining example of conservative politics trumping public safety, Republican Senator DeMint has held up President Obama’s appointment to that post,” criticized Btx3’s Blog. DeMint did have a few defenders. The most viewed news video on YouTube last week was of a frightening situation that could have turned out much worse. Pope Benedict XVI was walking down the aisle on Christmas Eve preparing to perform Mass in St. Peter’s Basilica when a woman from the crowd jumped a divider and knocked him over. The incident was caught on camera by two Americans, MaryBeth and Steve Burns, who were also in the crowd. The Associated Press’ video of the event, which included raw footage of the attack and images of Pope Benedict continuing the service, was viewed more than two million times.